I never mentioned before today mini nuclear plants. It is now time to do so as the company Hyperion Power Generation plans to sell mini nuclear modules within five years. Relatively small (see left for scale), these modules could bring affordable and greenhouse gases-free electricity to up to 10,000 households for seven to ten years without being refueled. Is this a good idea? Are safety issues tackled in a convincing way? Wouldn’t that increase nuclear proliferation? The answers to these questions are in today’s article. The US government has licensed the technology to Hyperion, a New Mexico-based company which said last week that it has taken its first firm orders and plans to start mass production within five years. ‘Our goal is to generate electricity for 10 cents a watt anywhere in the world,’ said John Deal, chief executive of Hyperion. The first confirmed order came from TES, a Czech infrastructure company specialising in water plants and power plants. ‘They ordered six units and optioned a further 12. We are very sure of their capability to purchase,’ said Deal. 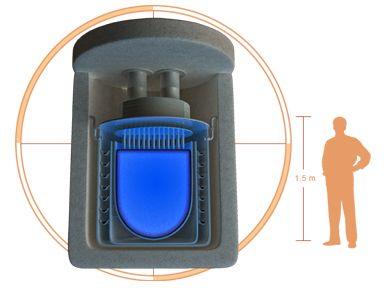 The reactors, only a few metres in diameter, will be delivered on the back of a lorry to be buried underground. They must be refuelled every 7 to 10 years. Because the reactor is based on a 50-year-old design that has proved safe for students to use, few countries are expected to object to plants on their territory. An application to build the plants will be submitted to the Nuclear Regulatory Commission next year. For more information about the Hyperion modules, please go to the official company page. The International Energy Agency published yesterday its World Energy Outlook which stressed that nuclear should become more important. Indeed, World Nuclear News quoted them stating that nuclear capacity must grow by 80 percent by 2030. Is this the solution to our energy and climate problems ? It is worth noting that Toshiba is working too on mini nuclear plants. If you are looking for more about what nuclear reactors might look like in the near future, please check out this article. In any case, be sure that I will keep you updated on that topic. So for this and for much more, stay tuned ! There are many misleading things in that article and on Hyperion’s website. To begin with, The Guardian‘s maths is wrong – $25 million into 10,000 homes is $2,500 per home, not $250. Interesting that the misplaced zero gives a figure in favour of the reactor, rather than against it. A paid advertisement masquerading as an article, perhaps? On their website they claim, “nuclear is not a “new” alternative to fossil fuel-based energy. It is the safest, most reliable, and least harmful way to generate electricity.” Nuclear is safer, more reliable and less harmful than all hydro, geothermal, tidal, wind or solar? Their website is just a big advertisement, giving no details of the construction of the thing, its maintenance and security requirements and the like. Their last FAQ reveals that the design isn’t licensed by the US NRC yet. The Hyperion is a hydrogen-moderated, potassium-cooled reactor with powdered uranium hydride as fuel. It’s a variant of the TRIGA reactor design, which is water-cooled and moderated. The TRIGA design uses a uranium hydride-zirconium alloy, with the uranium enriched to just under 20%. The benefit of the TRIGA design is that as its temperature rises the hydrogens on the uranium atoms absorb more neutrons, thus slowing down the fissioning and cooling everything down again. However, this only works so long as the water stays in the reactor, if someone let out the plug there’d be trouble. The Hyperion still uses uranium hydride, though it’s unclear if zirconium is involved – I don’t see how it couldn’t be. But liquid potassium is the coolant instead of water. This implies a higher operating temperature than the TRIGA for the Hyperion reactor – 60-750C against water’s 0-100C. Sodium has been used as a coolant before, but not potassium. It’s not clear why they’d use potassium rather than the proven sodium – possibly because potassium is the least-dense of all metals, so its use would keep the overall weight of the reactor down. Potassium is like sodium a highly-reactive metal, on contact with water it reacts violently to form hydrogen and potassium oxide; the reaction is so energetic that the hydrogen ignites in air. Boom. If potassium is stored for a long time in a jar with air in it, peroxides form which are shock-detonated explosives. So they’d have to have a pretty good vacuum in the reactor. But that is quite doable. This is probably the reason they are keen to bury the thing underground, so that if there is a breach of the shell the resulting explosion will be contained. In regards to the claim that it doesn’t contain weapons-grade material: only a few naval reactors contain weapons-grade material, most don’t, so that’s not a big selling-point. Reactors are used to make bomb material, they don’t usually have bomb material put into them. However, it is true that the uranium hydride used in this reactor design is difficult to refine into pure uranium as is typically used in uranium bombs. In the 1950s the Americans twice detonated bombs made of uranium hydride, but the hydrogen damps the reaction, so that the amount of uranium which would give an explosion of 2kt yield normally would only give a 200t yield. So the uranium hydride bomb is the kind of bomb which would give you effects like the levelling of the World Trade Centre and the ruins still smouldering toxic a year later, rather than flattening a city. Of course none of this affects the plutonium which would be created in the reactor over the years of its operation. So the key thing is keeping the thing sealed over those years, so no-one can get at the material to make bombs out of it. This is difficult, since few machines controlling such high energies can get by without regular maintenance. If nothing else, you’d want to ensure that the reactor’s seals were intact. A leak of the potassium into air or soil would give you a chemical explosion which could scatter the radioactive material, and if not scattered, the fuel in the absence of the coolant would reach much higher temperatures – not a meltdown, but it’d make the cleanup bloody difficult. The nuclear industry is even worse than the renewable with wild promises of the cheap and easy power that’s always just a few years from development, while understating the technical difficulties involved. Just look at wave power – sounds brilliant, but the only big project being done is in Portugal, and that’s way behind schedule, it turned out not to be as easy to as their press releases indicated. Still, lots of people babbling excitedly about it. By all means we should research things and hope for brilliant developments. But we should plan for our towns, cities, provinces and countries on the basis of what has been demonstrated to work well. That ain’t the Hyperion. To get a nuclear reactor working, or to make a bomb, you need to “enrich” the uranium, increasing the fraction of U-235 – it’s that portion that splits and produces energy. However, the remaining U-238 which doesn’t fission also absorbs split bits of U-235 atoms and becomes Pu-239 – plutonium. Now, you can make a bomb with highly-enriched uranium, or with plutonium. So a reactor which begins with highly-enriched uranium, that begins as offering lots of bomb material, but after a few years the U-235 fraction has dropped and it’s less useful as bomb material. So something like a naval reactor starts as a big weapons risk and then is less so over the years. Whereas a reactor like the Hyperion which begins with low-enriched uranium, so isn’t much of a weapons risk… but over time, it produces plutonium and thus increases the weapons material. So in a uranium reactor, either you begin with a high risk of offering weapons material and then have that risk decline over time, or you begin with a low risk and have that increase over time. Either way, there’s always weapons-grade material in the reactor. Yes, if we reduce our energy use, everything else becomes much easier. It buys us more time to change to other power sources, it saves us money, and so on. $2,500 is indeed a decent price for 5-10 years of electricity. However, that’s the wholesale price of the reactor. The retail price of anything is 2-10 times the wholesale price. When it comes to our energy, transport and food, I’m never that convinced by or interested in arguments about price. Firstly, price always varies crazily, a generator which costs $1 billion in country A ends up costing $4 billion in some other country. And when it comes down to it, we’ll pay what we have to for these things. Other aspects such as use of depletable resources, pollution, safety, reliability and so on are much more important. You shouldn’t edit quotes for content. When quoting someone, you leave everything intact, their mistakes, their opinions or otherwise. I mean, if you wrote, “nuclear is a good idea”, do I get to edit it on the basis that I consider that a mistake and to say, “Ed says, nuclear is a not a good idea”? The mistakes people make – not whether this or that is a good idea, but mistakes with basic arithmetic and science and so on – are an indication of one of two things: either it’s just a promotion piece, not an honest look at something, or else they’re lacking in critical thinking and analytical abilities, that is they’re a bit stupid or lazy. It’s important for the reader to know if someone speaking in favour of something is perhaps either secretly an advertiser or else stupid. That lets the reader know how sceptical they ought to feel about that piece of writing. It’s quite alright to point out the mistake within the text, putting your own comments in square brackets , for example “[their maths is wrong, this is $2,500 per household]”. Hyperion’s website says 20,000 homes. So, $25M/20k homes for 8 years is $156.20 per year for an average AMERICAN home. …and nuclear is more reliable – wind and solar are not baseload capable, tidal is in its infancy, hydro and geo are reliable but not available everywhere. …and less harmful – hydro is eco-destructive, solar requires some of the most toxic substances in the world for its manufacture… The nuclear industry accounts for every GRAM of fuel and waste – what other industry is that careful? If we waited for technology to be completely proven prior to commercialization, we would not have electric lights, computers, steam generators, etc. ad infinitum. Though he/she sounds relatively educated on the subject, Kiashu is obviously anti-nuke and does not have any particularly germane ciriticisms of this technology – just wants to bash it. > Forky Lee : thanks for your comment. I agree with you on some points, and totally disagree with you on others. Nonetheless, please be cool with Kiashu. He is my main commentator here and I appreciate very much what he writes here and on his blog. We may don’t agree on everything, but that’s why discussions are for: exchanging opinions. On this, please be welcome here. Thanks for reading and once again for your comment.